Lurgan & Portadown Drill Squad Competition. - Belfast Btn. Trophy & The N.I. Drill Squad Competition. 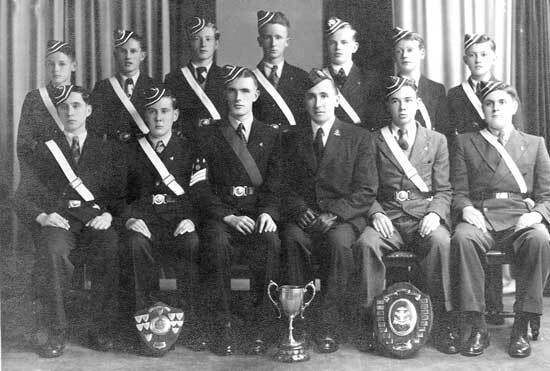 Back Row L to R; Edwin Joyce - William Hewitt - Maurice Davison - Billy Lambe - Harry Burrows - Noel Magee - Roy Woolsey. Front Row: Kenny McClatchey - Jim McClung - Sgt. Harry cooke - Capt. William Coulter - Dessie Graham - Wilson Joyce.